To accurately recompute dose distributions in chest-wall radiotherapy with 120 kVp kilovoltage X-rays, an MCNP4C Monte Carlo model is presented using a fast method that obviates the need to fully model the tube components. 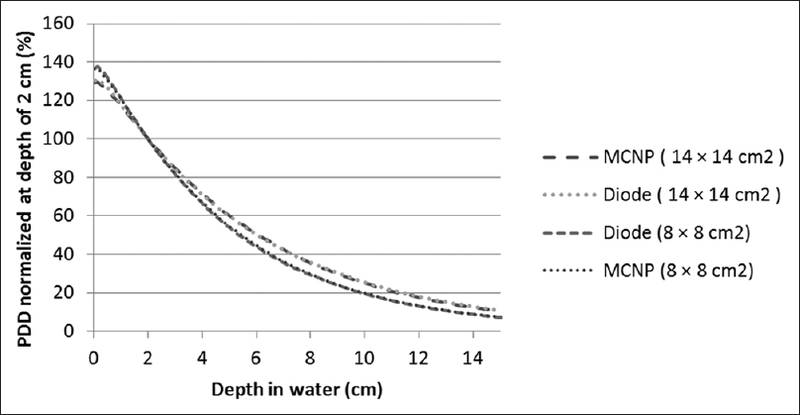 To validate the model, half-value layer (HVL), percentage depth doses (PDDs) and beam profiles were measured. Dose measurements were performed for a more complex situation using thermoluminescence dosimeters (TLDs) placed within a Rando phantom. The measured and computed first and second HVLs were 3.8, 10.3 mm Al and 3.8, 10.6 mm Al, respectively. 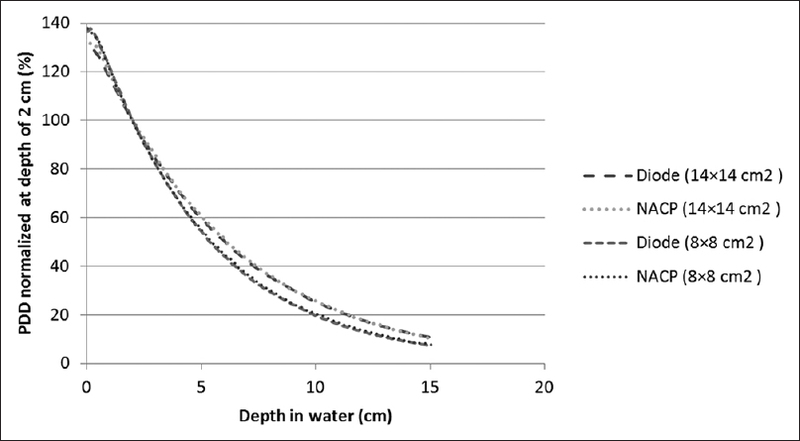 The differences between measured and calculated PDDs and beam profiles in water were within 2 mm/2% for all data points. In the Rando phantom, differences for majority of data points were within 2%. The proposed model offered an approximately 9500-fold reduced run time compared to the conventional full simulation. The acceptable agreement, based on international criteria, between the simulations and the measurements validates the accuracy of the model for its use in treatment planning and radiobiological modeling studies of superficial therapies including chest-wall irradiation using kilovoltage beam. The complexity in this technique from the dose calculation point of view arises from the presence of beam obliquity, patient contour irregularity and radiation field splash-over, as well as lung and bone tissue heterogeneities. Therefore, the significance of 3D treatment planning to ensure target dose coverage and reduce organ-at-risk dose is undeniable. Most treatment planning systems are, however, designed for megavoltage beams. Similarly, the Monte Carlo (MC) method has been extensively used to perform dosimetric investigations in the megavoltage region and only a limited number of studies have been reported regarding MC modeling of kV X- ray therapy. A few previously published studies have reported on measured X-ray spectra ,,, , and various programs have been developed for the calculation of kV X-ray spectra and half-value layer (HVL) values based on calculated spectra. , For example, a miniature radiosurgery kV tube was simulated by Yanch and Harte using ITS Version 3.0 'p' codes. Some useful studies were also published by Verhaegen et al. They used MCNP4B and EGS4/BEAM to simulate kV X-ray units to obtain accurate information for absorbed dose calculations in water for kV X-rays. In particular, the photon spectrum, planar fluence and the angular distribution of the photons at the collimator exit of the X-ray unit were studied. , Another application in the kV energy region was published by Hill et al., which simulated a kV X-ray beam and water phantom to calculate deep and superficial doses using the EGSnrc code. The X-ray beams were 75 − 135 kVp with field sizes of 2, 5 and 8 cm diameter. Knoos et al., also simulated an orthovoltage unit using EGSnrc. The BEAMnrc code was used to transport electrons, produce X-ray photons in the target and transport them through the treatment machine down to the exit level of the applicator. Further transport in water or CT-based phantoms was simulated by using the DOSXYZnrc code. Most of the studies mentioned above used EGS4, EGSnrc (or BEAMnrc) or MCNP4B. BEAMnrc is faster in calculations and it is easier to use in defining treatment head geometries but MCNP4C offers more flexibility in defining complex geometries. In all previous studies, all the relevant components of the X-ray tube were simulated. The purpose of this study was to develop a fast reliable dose calculation engine, which can be used in chest-wall treatment planning. In contrast, the main purposes of the previous studies were assessment of kV X-ray beam features, which were mostly time-consuming. This study adds evidence that it is possible to simulate a kV beam without simulating the components and processes leading to production of X-rays with sufficiently high accuracy even in realistic inhomogeneous media. This simplification has benefits in terms of time needed to design the MC model and the simulation run time. This approach is also useful when some details regarding the tube are inaccessible or not known. 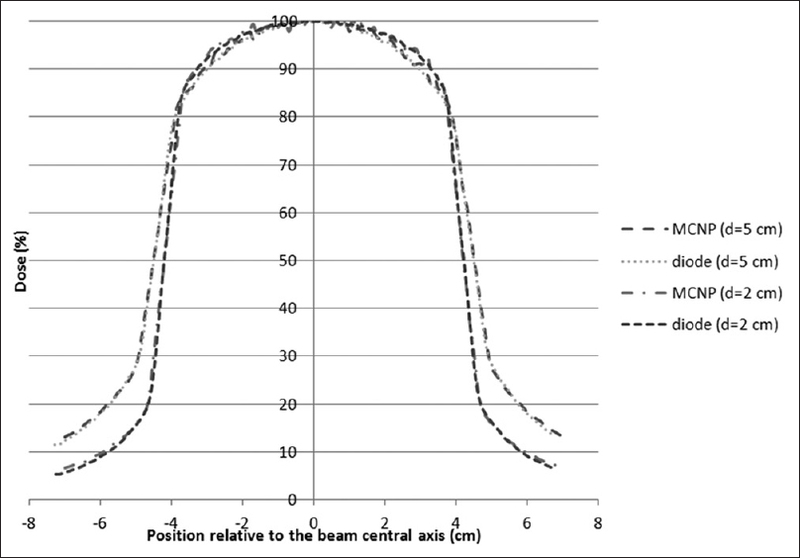 In this study, the beam properties in an inhomogeneous phantom together with beam obliquity and contour irregularity were also assessed, which had not been performed in most of the previous studies with kV therapy beams. This study also adds further evidence to validate the accuracy of MCNP4C in inhomogeneous anthropomorphic phantoms for 120 kVp X-rays. A routine method to accurately model X-ray tubes is simulating their almost every detail such as target, filter, mirror, etc. The secondary purpose of this study was to check the feasibility of implementing a method that allows us to model the X-ray beam without simulating all the details in the X-ray tube (namely, a photon-source approximation; using a photon source instead of an electron source in the simulations). The reduction in the number of modeled components would be beneficial in terms of (i) Future designing of MC X-ray tube models and (ii) their simulation times. Our kV X-ray therapy machine is the Stabilipan unit (Siemens, Germany) with a tungsten target angled 22 degrees and a total filtration equivalent to 2 mm Al. Collimators (shutters), instead of applicators (cones), were used on this unit to adjust the field size. Further validation experiments were carried out by dose measurements for a more realistic and complex situation of oblique beam incidence on the chest wall using 10 thermoluminescence dosimeters (TLDs) placed within the chest wall, heart and lung regions of an inhomogeneous anthropomorphic Rando phantom. The TLDs were calibrated in the same beam quality by intercomparison with the above-mentioned calibrated Farmer-type ion chamber. Meticulous TLD methodology using a previously described technique was employed to keep the measurement uncertainty within 2%. The treatment field was defined on the Rando phantom exactly like a real patient and a routine treatment set up was performed with 50 cm FSD and 15-degree tube angle medially. In order to reduce the run time significantly, these simulations were simplified by using a photon source instead of an electron source. Instead of modeling the machine components and an electron source to create the X-ray spectrum needed for simulations, a spectrum processor  was used. By entering information such as target material, tube voltage, anode angle, and filter material and thickness, the processor could calculate the X-ray spectrum in 0.5 keV intervals. Using a pinhole technique, the tube's focal spot dimensions measured by film were 7 × 7 mm 2 . In order to be able to design a photon source that could model the heel effect correctly, a cylinder subroutine source was defined. The photon source was simulated as a 7 mm long and 7 mm diameter cylinder with its long axis along the anode-cathode direction, bisected in length by the beam's central axis, and divided in length into 7 slices by planes at 1 mm intervals. This allowed the poly-energetic source to be biased along its length, i.e., to have a gradual decrease in weight of X-ray production toward its anode-side end, to mimic the loss of X-ray production observed at the anode side in heel effect. This replaced the more routine method of modeling an electron source, target and simulating both electron and photon transport within the target to produce the observed heel effect. The exact internal and external contours of the Rando phantom were obtained and measured from CT images and the same geometry was created by carefully defining the planes in the MCNP input file. Data cells were defined exactly in the locations where TLDs were placed during experimental measurements. In order to reduce run time to a practical level while maintaining a low statistical uncertainty, variance reduction techniques were utilized. Geometry splitting was implemented in which the geometry between the tube and data cells was split by concentric cylinders, the importance values of which increased gradually (in relatively small steps: 1, 6, 36, 216) toward the center (to increase the probability of interactions nearer the data cells without biasing the end results). Also, energy cut-offs were used; electrons were transported in the phantom down to the energy of 10 keV and the photon transport cut-off energy was 1 keV. The results of the experimental measurements and MCNP simulations were compared to evaluate the accuracy of the model. To the best of our knowledge, there are no specific criteria of acceptability for treatment planning calculations for kV beams. The criteria of acceptability used in these comparisons were those set out in the International Atomic Energy Agency (IAEA) TECDOC-1583  and the American Association of Medical Physicists (AAPM) TG-53 Report 62,  the scopes of which do not exclusively cover kV beams. 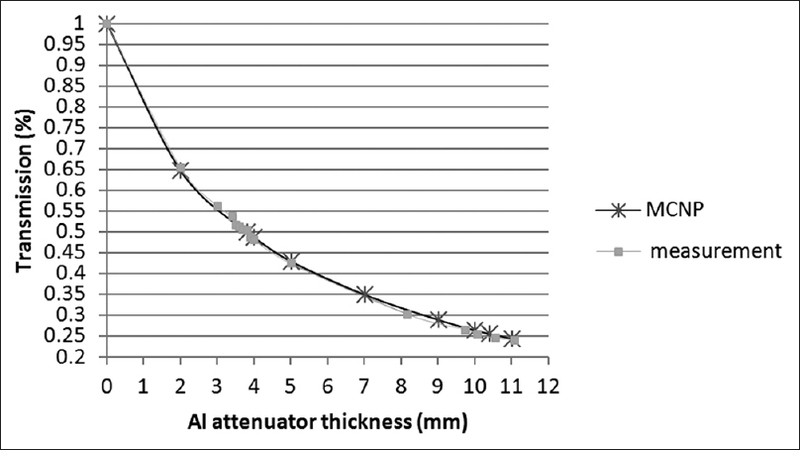 The first and second HVLs were 3.8 and 10.3 mm Al, respectively [Figure 1], which were in very close agreement with the values obtained by MCNP (3.8 and 10.6 mm Al). This constituted the first test of the X-ray spectrum modeled. The comparison between the PDDs measured by the electron diode and the NACP chamber showed that their measured PDDs agreed within 2% at all data points, the agreement for majority of the points were lying within 0.4 − 0.8% [Figure 2]. This close agreement is interesting, given the spectral changes with depth in water and the well-known higher-energy dependence of diodes compared to ionization chambers. 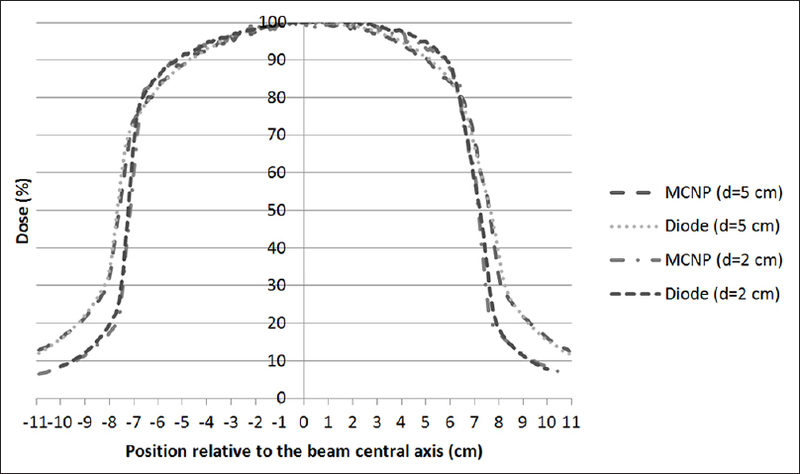 However, our results indicate that this effect is negligible with the combination of the beam spectrum, electron diode and depth range (up to 15 cm) used. Therefore, comparisons were made with the diode for the rest of the measurements presented here. The measured and calculated data for the inhomogeneous Rando phantom were also compared. [Table 1] shows the results of dosimetry in a real and simulated Rando phantom. According to the criteria of acceptability recommended by the IAEA and the AAPM, , acceptable differences between measurements and calculations on the central axis for an inhomogeneous 3D phantom are 3% and 5%, respectively. In off-axis regions, the acceptable differences are 3% and 7%, respectively. MCNP-calculated relative doses in the Rando phantom agreed with TLD measurements within 4.5% of the prescription dose; the differences for majority of the data points were within 2%. Again, this shows generally acceptable agreement between calculations and measurements by at least one of the above-mentioned criteria. Our findings disagree somewhat with those of Verhaegen et al. who concluded that complete set up (focal spot size, target, inherent filtration and collimators) must be modeled accurately in order to be able to reproduce the measured dose distribution. The simulation of PDD using the MCNP code took about six hours to perform 10 9 histories with an estimated relative error of about 0.25 to 0.3% in the high-dose regions, when it was running on a Pentium 4, Intel Core 2 Duo CPU P8700 2.53 GHz CPU. To compare the run time when a photon source was designed instead of an electron one, the complete set up of X-ray tube including an electron source was simulated (conventional method) and beam profile computation was repeated using this simulation. An example of the number of histories (NPS) and the computational time (CTME) required to reach a relative error (R) value of 0.1 in MCNP4C when simulating an electron source (conventional method) and a biased photon source (proposed method) are presented in [Table 2]. From this Table, it can be seen that the run time of the biased photon source is more than 9500 times less than that of the conventional method. Our proposed solution is an alternative to the widely used method of saving phase-space files of the photons emerging from the target (following full simulation of electron and photon interactions in the target). The aim and scope of this paper does not include an investigation of the relative merits of photon-source approximation compared to saving phase-space files. However, obviation of the need to manage huge phase-space files and a reduced requirement for having and implementing detailed geometry information can be mentioned as advantages of the photon-source approximation method. The superficial X-ray therapy technique described here is one of several possible alternatives for chest-wall radiotherapy. Discussing the advantages and disadvantages of this technique compared to the others is, however, outside the scope of this paper. The proposed, simplified method of simulating a kV X-ray therapy unit offers huge time savings in terms of modeling and run time, which is necessary for implementation of MC treatment planning. The acceptable agreement between the results of the simulations and the measurements validates the accuracy of the MCNP model despite the exclusion of the components and processes leading to production of X-rays, for use in treatment planning and radiobiological modeling studies of chest-wall irradiation using kV beams. In addition, this model can be used for other (often simpler geometry) superficial treatments. Omidvari S. Department of Radiotherapy and Oncology, Shiraz University of Medical Sciences, Shiraz, Iran. Private communication 2014. Mosleh-Shirazi MA, Zeinali-Rafsanjani B, Faghihi R, Mosalaei A, Hadad K, Karbasi S. A Monte-Carlo Study of Chest-Wall Radiotherapy by Kilovoltage X-Rays. Proceedings of The World Congress on Medical Physics and Biomedical Engineering. Beijing, China; 2012. Verhaegen F, Nahum AE, Van de Putte S, Namito Y. Monte Carlo modelling of radiotherapy kV X-ray units. Phys Med Biol 1999;44:1767-89. Seuntjens J, Thierens H, Segaert O. Response of coaxial Ge(Li) detectors to narrow beams of photons for stripping of X-ray bremsstrah lung spectra. Nucl Instrum Methods Phys Res A 1987;258:127-31. Seelentag W, Panzer W, Drexler G, Platz L, Santner F. A catalogue of spectra for the calibration of dosemeters. Med Phys 1982;9:134-5. Peaple LH, Burt AK. The measurement of spectra from X-ray machines. Phys Med Biol 1969;14:73. Epp ER, Weiss H. Experimental study of the photon energy spectrum of primary diagnostic X- rays. Phys Med Biol 1966;11:225. 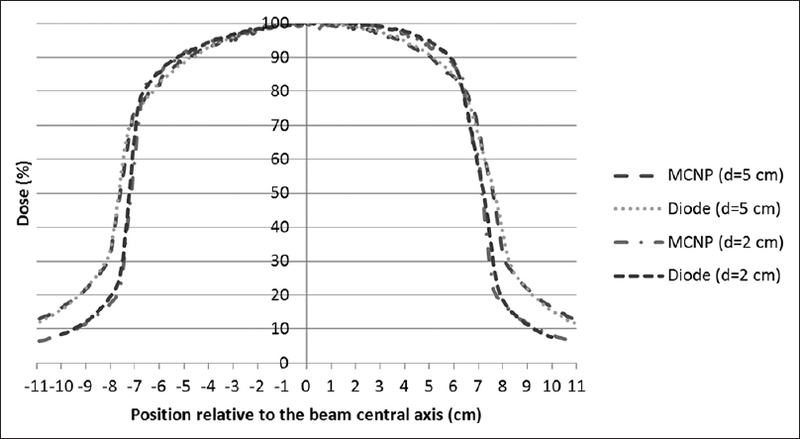 Birch R, Marshall M. Computation of bremsstrah lung X-ray spectra and comparison with spectra measured with a Ge(Li) detector. Phys Med Biol 1979;24:505-17. Iles WJ. Computation of X-ray bremsstrahlung spectra over an energy range 15 keV-300 keV. London National Radiological Protection Board Report R2041987; (HMSO). Yanch JC, Harte KJ. Monte Carlo simulation of a miniature, radiosurgery x-ray tube using the ITS 3.0 coupled electron-photon transport code. Med Phys 1996;23:1551-8. Verhaegen F, Seuntjens J. Monte Carlo modelling of external radiotherapy photon beams. Phys Med Biol 2003;48:R107-64. Hill R, Healy B, Holloway L, Baldock C. An investigation of dose changes for therapeutic kilovoltage X-ray beams with underlying lead shielding. Med Phys 2007;34:3045-53. Knöös T, Rosenschöld PM, Wieslander E. Modelling of an Orthovoltage X-ray Therapy Unit with the EGSnrc Monte Carlo Package. J Phys Conference Series 2007;74:021009. Mosleh-Shirazi MA, Faghihi R, Masudiefar M, Owrangi MA. Comparison of the MCNP4C and BEAMnrc Monte Carlo codes when simulating different electron energies of a Neptun 10pc linear accelerator. Proceedings of the 16 th International Conference on Medical Physics2008; Dubai, United Arab Emirates: 94-5. Chetty IJ, Curran B, Cygler JE, DeMarco JJ, Ezzell G, Faddegon BA, et al. Report of the AAPM Task Group No. 105: Issues associated with clinical implementation of Monte Carlo-based photon and electron external beam treatment planning. Med Phys 2007;34:4818-53. Nedaie H, Mosleh-Shirazi MA, Allahverdi M. Monte Carlo N Particle code - Dose distribution of clinical electron beams in inhomogeneous phantoms. J Med Phys 2013;38:15-21. Mosleh-Shirazi MA, Hansen VN, Childs PJ, Warrington AP, Saran FH. Commissioning and implementation of a stereotactic conformal radiotherapy technique using a general-purpose planning system. J Appl Clinl Med Phys 2004;5:1-14. Sina S, Faghihi R, Meigooni AS, Mehdizadeh S, Mosleh-Shirazi MA, Zehtabian M. Impact of the vaginal applicator and dummy pellets on the dosimetry parameters of Cs-137 brachytherapy source. J Appl Clin Med Phys 2011;12:3480. Mosleh-Shirazi MA, Faghihi R, Siavashpoor Z, Nedaie HA, Mehdizadeh S, Sina S. Independent evaluation of an in-house brachytherapy treatment planning system using simulation, measurement and calculation methods. J Appl Clin Med Phys 2012;13:3687. Li XA, Ma CM, Salhani D. Measurement of percentage depth dose and lateral beam profile for kilovoltage X-ray therapy beams. Phys Med Biol 1997;42:2561-8. Wagner GS, Batey SE, Mosleh-Shirazi MA. Directionality of extruded lithium fluoride thermoluminescent dosemeters in a cobalt-60 beam. Br J Radiol 2000;73:1007-9. Los Alamos National Laboratory. RSICC computer code collection MCNP4C: Monte Carlo N-Particle Transport Code System. In: Rsic, editor. U.S. Department of energy; 2000. p. 1-13. Nedaie H, Mosleh-Shirazi MA, Shariari M, Gharaati H, Allahverdi M. Assessment of different MCNP Monte Carlo codes in electron absorbed dose. Rep Pract Oncol Radiother 2006;11:293-8. Mosleh-Shirazi MA, Hadad K, Faghihi R, Baradaran-Ghahfarokhi M, Naghshnezhad Z, Meigooni AS. EchoSeed Model 6733 Iodine-125 brachytherapy source: Improved dosimetric characterization using the MCNP5 Monte Carlo code. Med Phys 2012;39:4653-9. Reilly AJ, Sutton D. Spectrum processor. IPEM Report 78: Catalogue of Diagnostic X-ray Spectra and Other Data; 1997 . Mosleh-Shirazi MA, Karbasi S, Shahbazi-Gahrouei D, Monadi S. A Monte Carlo and experimental investigation of the dosimetric behavior of low- and medium-perturbation diodes used for entrance in vivo dosimetry in megavoltage photon beams. J Appl Clin Med Phys 2012;13:3917.
International Atomic Energy Agency (IAEA). 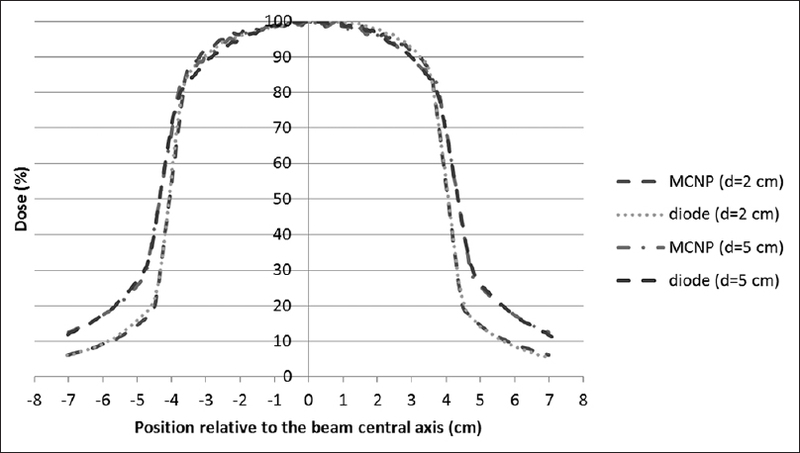 Commissioning of radiotherapy treatment planning systems: Testing for typical external beam treatment techniques. Austria: TECDOC-15832008. Fraass B, Doppke K, Hunt M, Kutcher G, Starkschall G, Stern R, et al. Quality American Association of Physicists in Medicine Radiation Therapy Committee Task Group 53: Assurance for clinical radiotherapy treatment planning. Med Phys 1998;25:1773-829. Zeinali Rafsanjani B, Mosleh-Shirazi MA, Faghihi R, Mosalaei A, Omidvari S, Hadad K, Karbasi S. Breast cancer and its radiotherapeutic methods. Iran J Med Phys 2012;9:75-85.